Football is a fun, but very physical and competitive sport. Grade school, high school, college, amateur, weekend and NFL players are all at risk from a host of injuries due to hard hits. 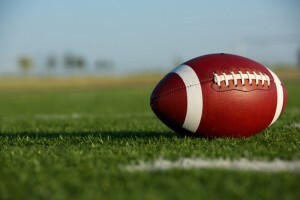 The most common football injuries include ankle sprains; torn and pulled hamstrings; torn menisci (cartilage in the knee); anterior or posterior cruciate ligament (ACL/PCL) tears, pulls and strains; shoulder dislocation, tendonitis and pain; muscle contusions; head and back problems and soreness; jammed hands and arms; and headaches. Other injuries include those resulting from overuse or overtraining and heat, especially at the start of the season during training camp. Additionally, no matter what their age and level of play, football players are always looking for ways to keep themselves primed and gain an edge on the competition. Enter chiropractic care from a board-certified doctor of chiropractic (DC). Many football players, both younger and older, seek out the services of chiropractors because they know routine chiropractic care is effective when it comes to preventing football injuries, as well as achieving overall wellness and advancing preventative care. Studies have also shown regular chiropractic care helps football players heal quickly and properly, lessens their pain and shrinks any inflammation they might experience, allowing them to get back on the field sooner. In fact, “all National Football League (NFL) teams rely on DCs in varying capacities, and 77 percent of athletic trainers have referred players to a chiropractor for evaluation or treatment,” according to the American Chiropractic Association (ACA). Furthermore, football greats such as Joe Montana, Emmitt Smith, Jerry Rice and Dan Marino have always relied on the care of chiropractors to stay in top physical shape and extend their careers. Routine chiropractic care can clearly help all levels of football players by undoing the punishment the body takes while playing, and naturally, relieve and decrease pain associated with injuries they might sustain on the gridiron. At the Medford office of Dr. Todd Goldman at Total Chiropractic Care and Wellness, football players will find a range of chiropractic treatments designed to improve their performance and help prevent injury. Dr. Goldman helps with conditioning and exercises to enhance speed and flexibility, adjustments to increase the range of motion, and modifications to strengthen balance and improve posture and alignment. Get a pre-season health and wellness evaluation. Properly warm up and cool down, and stay adequately hydrated to maintain health and minimize cramps. Always incorporate strength training and stretching, and remain active in the offseason. Wear properly fitted protective equipment, and always tackle with the head up. If you have concerns about injuries or prevention strategies, then speak with a sports medicine professional or athletic trainer, contact your physician and/or consult with your chiropractor. To learn more how chiropractic care can help you stay in the game longer, call Dr. Goldman today at (631) 447-2299.